As we began our storytime season last fall, we were looking for a way to increase caregiver participation in our storytimes. We have a variety of storytimes at our library – baby storytime, toddler storytimes, preschool storytimes, and family drop-in storytime, all of which include caregivers. Some of our caregivers are new to attending storytime; others were just more uncomfortable. We have multiple staff members running storytimes, and leaders were sharing rhymes, finger plays, and songs differently. Some used handouts; others taught the rhymes to caregivers while in storytime. 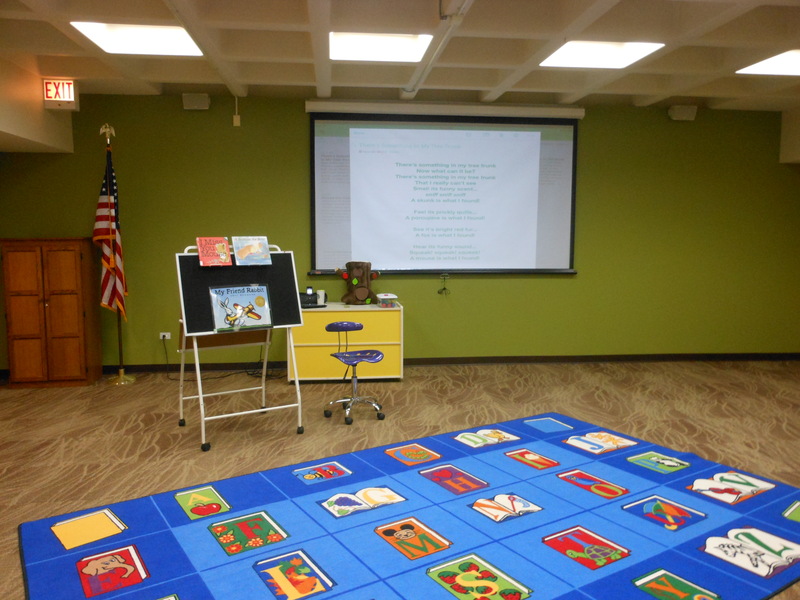 We wanted to find a universal way to share rhymes, finger plays, and songs – especially since we do communal storytime planning in our department around the same weekly theme. I decided to try and find a way to project words to rhymes, finger plays, and songs onto a large screen that is behind us during storytime. The idea came from an unlikely place – I have attended some church services that project lyrics to songs onto a large screen and thought we could do that! Evernote is a multi-platform program designed for note taking. It is available in a free and also a paid version. I heard about Evernote before, so I thought the free version might work for this purpose. Our department consists of shared workstations, so having a cloud based program we could utilize at any computer while planning for storytimes was essential. I downloaded Evernote to multiple computers and to our department iPad and spent time playing with Evernote with fellow staff members. We began adding rhymes, songs, and finger plays to our Evernote account. We enter in each rhyme, song, or finger play as its own note. We then organize “notebooks” based on the week’s theme. That way when we are presenting storytimes we just open the iPad to the week’s “notebook” and all of our rhymes for the week are ready to go. As we continue to add storytime resources to Evernote, we have created a searchable database of rhymes, finger plays, and songs. It is very easy to find our favorite activities for storytime using Evernote. We synch the Evernote information through the cloud to the iPad Evernote App. Then we connect the iPad to the projector that is in our programming room. We simply open the Evernote App, select the week’s notebook, and we are ready to go! The Evernote App is quick and easy to navigate so you can seamlessly move between different activities while leading storytime. Now we always connect the iPad to the projector for storytimes. Consequently, it is much easier to transition to different Apps on the iPad while presenting and more staff have learned how to incorporate the iPad into their storytimes. Using Evernote has proved to be an approachable and practical way to help more staff become comfortable using the technology if they want to try it. Our parental participation has greatly improved! Caregivers are more comfortable singing along, the lyrics are visible and hands are free. Plus, I’m not singing solo anymore with my not-so-strong voice. This has made me more confident incorporating more rhymes and songs in my own storytimes. Additionally, some of the kids notice the words on the screen and know that we are doing another form of “reading.” I can point to certain words and letters while doing the rhyme or finger play, which helps them understand how letters and words form sounds. I think this is especially useful as kids will have to understand and utilize more forms of media than we can even imagine. Helping them navigate different ways to utilize literacy skills will only help them along their way. The use of Evernote has extended into other programming as well. We recently hosted an Andy Warhol print making program and were able to use Evernote to show his work on a large scale. The note aspect allowed the program host to quickly navigate through the images without the rigidity of Power Point. Michelle Kilty is the Digital Literacy Librarian in Youth Services at Helen Plum Library in Lombard, IL. You can find her on twitter @michelleannlib. Posted on March 19, 2014, in Story Time and tagged Evernote, Michelle Kilty. Bookmark the permalink. 7 Comments. I good way of using apps to increase parent/caregiver participation at storytime. 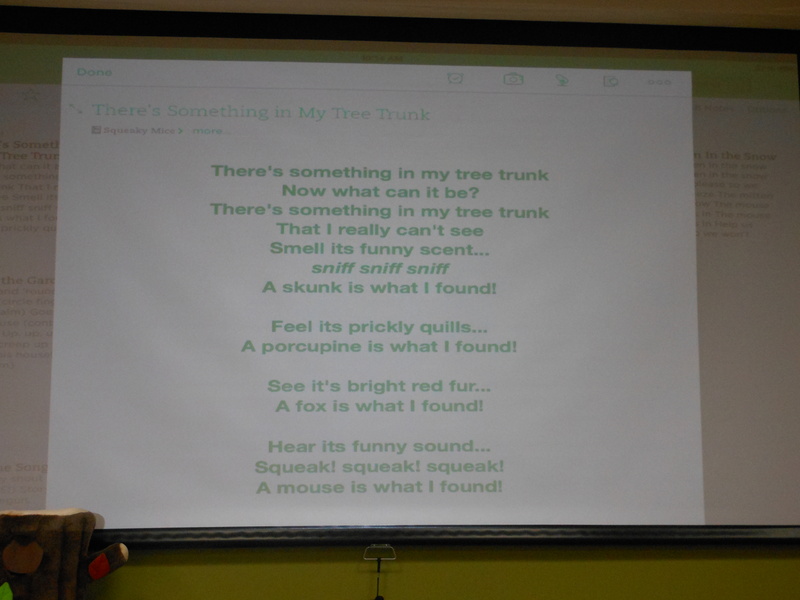 One thing I hadn’t thought of when using projected lyrics is the “print rich environment” that the kids will pick up on! Great use of technology to support engagement!